The loss of one or more natural teeth can negatively impact your life in ways you don’t even expect at first. Suddenly, it’s difficult to enjoy favorite foods like steak, speak clearly with long-time friends, or even smile for a group photo without wanting to hide away in the background. At the Family Dental Center of East Texas, we understand these struggles and want you to know that it’s not too late to regain the complete and confident smile you deserve. Our practice features several quality options that can be matched to your unique goals, preferences, and budgetary concerns – the first step is to simply schedule a consultation here in Center, TX. Why Choose Family Dental Center for Tooth Replacement? Maybe your lost tooth is well-hidden in the back of your mouth, or maybe you simply don’t want to fork over the money to have it replaced. “No one will even notice,” you say. “Isn’t it okay to just leave it alone?” While our doctors understand that budgetary concerns can make tooth replacement difficult for some, we strongly advise against doing nothing. Jawbone deterioration is a serious concern when missing teeth are present, and it can even increase your risk of losing additional teeth over time. Other consequences include a weaker bite, reduced self-confidence, and even possible changes in the way you speak. 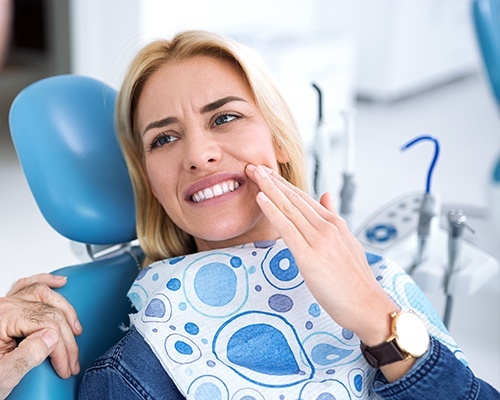 When faced with tooth loss, consider exploring available options with Dr. Youngblood and Dr. Martinez during a one-on-one consultation – we’re here to help! Just like the name implies, this sturdy type of dental prosthetic is designed to literally “bridge” the gap left by consecutive missing teeth. Traditional bridges are held in place by using additional dental crowns that cover nearby healthy teeth, essentially working like anchors. However, this approach does require surrounding dental structure to be minimized. 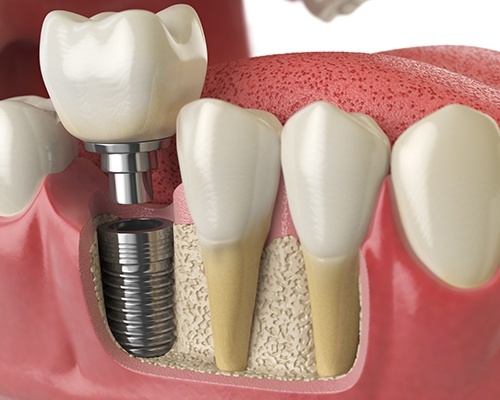 A healthier, longer-lasting option is implant-retained bridges, which rely on the support of two dental implants instead that are directly inserted into the jawbone. 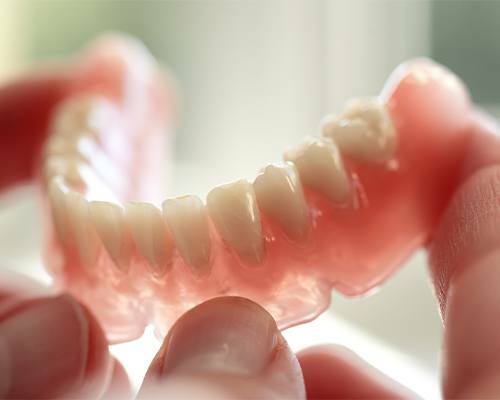 Our practice takes great pride in providing tooth loss patients with custom, high-quality dentures that look natural while also providing excellent everyday function. We carefully consider the shape of your overall mouth and existing oral structures when designing these prosthetics so that the final result is discreet and confident. Traditional dentures are designed to rest on top of the gum line and can be removed from the mouth whenever the patient desires. 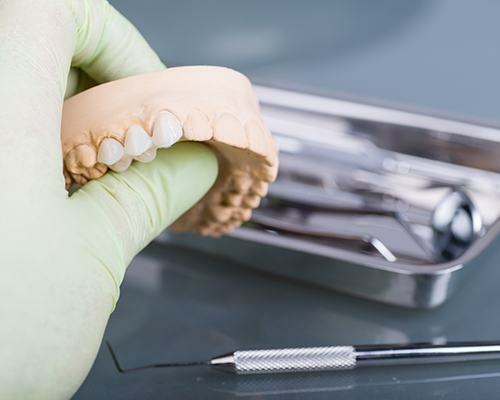 Alternatively, implant-retained dentures – which are held in place by attaching them over a number of anchored dental implants – offer much more permanence and stability. In today’s world, dental implants have become the top choice for replacing lost teeth, and it isn’t hard to understand why. They’re uniquely comprehensive, rebuilding every part of the natural tooth structure in a way that’s both beautifully aesthetic and healthy. Patients won’t have to worry about gradual jawbone deterioration or the loss of their facial features over time – instead, it will be like they never lost their original smile at all!